Today, collaborating goes beyond connecting computers or having people in a conference room together. Social networking technologies have led to a seismic shift in the way people work and interact, leading to the development of social business and collaboration tools. Over the last several years, many innovative and growing companies across the world have recognized this trend and saw opportunity. They have been adopting social intranet software and collaboration tools to engage employees, simplify communications, and provide consistent, improved customer support. They have reported dramatic increases in customer satisfaction, higher employee accountability, and streamlined communications. In fact, social intranet software and collaboration tools have paved the way for improved efficiency, problem-solving, enhanced productivity, and innovative growth. This offers companies a significant advantage over companies that have not yet embraced these technologies. Using collaboration tools alone has not been completely sufficient to create sizable profit increases. These companies have succeeded because they created and implemented a social strategy for their business. Then, by using social intranet software in a way that's tied to business outcomes, they've been able to achieve their goals. In their book, The Evolution of Social Business: Six Stages of Social Business Transformation, Charlene Li and Brian Solis surveyed 700 social media professionals and executives. They discovered that 34% of businesses surveyed felt that their social strategy was connected to business outcomes. The authors recognized that there are two kinds of social strategies: a social media strategy and a social business strategy. A social media strategy enables a company to plan out the channels, platforms, and tactics used for publishing, listening, and engagement. A social business strategy enables a company to choose and integrate relevant technologies and processes into business practices. This is done to build relationships and develop collaboration inside and outside the organization, improving processes and efficiency and creating value for the customer and the company as a whole. Using social media tools should definitely be a part of your social business strategy, however, using these tools in tandem with your social intranet enables you to create and share content both inside and outside your organization. When you build out your social business strategy, there are several things to keep in mind. The following suggestions include insight from Li and Solis’ book. Create a plan for developing and growing the organization, allocating resources, and executing goals. Your plan should include feedback from existing customers to understand social behavior, and it should include future communications to meet customer expectations. Social intranet software connects your people with ideas and expertise from customers – generating new sources of innovation and insight, while encouraging creativity and expanding reach for new business opportunities. An intranet removes any unnecessary boundaries between experts inside the company and experts outside in the marketplace. You can capture this knowledge and insight from many sources, allowing employees to adapt to changing priorities and industry changes, customer feedback, and new improvements. Take action. Create your social media presence both within the organization and the public. Make it easy for people to first share content within the company knowledge base ... and then share that same content (article, blog, video, etc.) to your social media pages. User driven content is easily created and accessible with intranet content tools. Any employee can contribute to your knowledge base. They can can also discover relevant insight and experts on any topic, furthering knowledge and engagement. Whether your employees are constantly on social networks like Twitter, Facebook, and LinkedIn; or your employees love to read blogs and watch YouTube videos, you can leverage these natural tendencies to share content, create new content, and grow your company. You can effectively market your company products and services through these channels as well as recruit new employees and discover what customers are interested in. You can also test out product concepts and ideas with employees and customers and get real-time feedback, enabling you to improve your product significantly. It's important that company leadership works directly with management and employees to ensure that there is a process for sharing content. Make sure employees value the importance of developing great content for consumers ... whether it's a series of knowledge articles for software support, or content for new product features. This will help grow the company’s brand presence and improve its Google page rank and SEO. Enhance relationships and increase engagement by encouraging open communication and dialogue, building communities, and participating in training and education. Intranet software enables your company to truly become a social business where employees genuinely feel valued; and where customers feel heard and their concerns are addressed systematically with relevant employee insight. 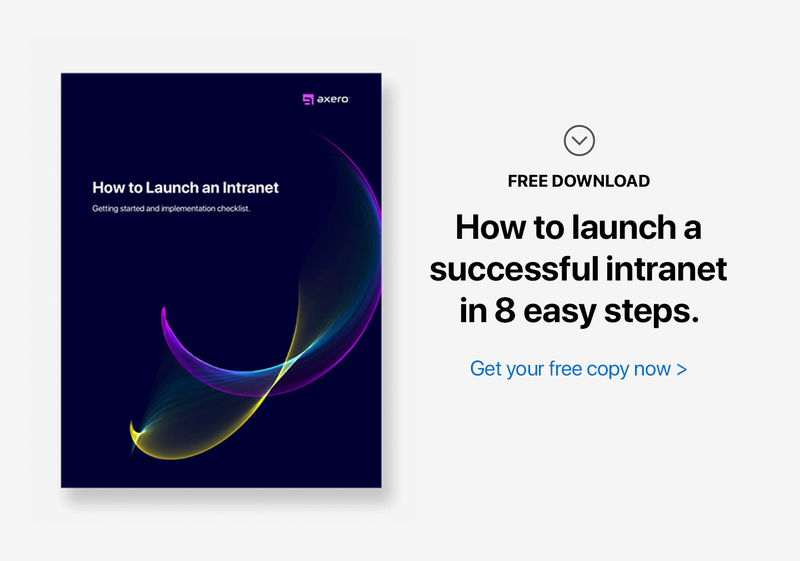 Some of the world’s leading organizations use social intranet software to attract and retain their best customers, drive innovation, and build highly productive, engaged, and enthusiastic teams. Periodically assess your intranet adoption and review progress. Make sure your employees are engaged, informed, and social tools are being used. You may want to create certain rules for engagement as well. Intranet adoption can present its own set of unique challenges whether it involves getting organized or changing hierarchical structures. It's important that you adapt to these challenges and take the time to reflect upon necessary changes. For instance, you can leverage the value of collaboration in your business environment by creating different groups for different projects and activities, creating articles and blogs, sharing relevant consumer insight, building and sharing calendars, uploading and updating files in the cloud, and keeping track of customer service issues. Ideally, at this point, there is more engagement from leadership and department managers so the organization feels less hierarchical and flatter, leading to more transparent dialogue and encouraging collaboration across departments. Collaboration will begin to expand into different areas of the business, and operation of these areas will need to adapt and have an appropriate social business strategy to ensure smooth transitions. Social intranet software lets you encourage a collaborative atmosphere that removes existing hierarchies. This flattens your organization, encourages communication, and accelerates knowledge sharing and learning. An intranet also facilitates employee empowerment, which leads to greater engagement, interest, and productivity. After successfully completing the previous steps, your company now has a developed social business strategy ... from brainstorming and ideation to process, deployment, and sales. Your employees can now find quick answers to common questions and get instant feedback by identifying and communicating with experts in your organization, regardless of location. You'll have online workspaces where employees can come together to work on a project. They can gather all relevant information in one place. You can provide your team with a centralized intranet homepage where each employee can get a consolidated view of their social data from all of their applications. You can also connect individuals by common interests, responsibilities, or areas of expertise, and create groups to share information, exchange ideas, and collaborate on projects. A successful social business strategy depends on changing your organization and company culture to leverage the collaborative potential of social technologies. Success also requires connecting with broader communities to create trust, encourage participation, and build a positive community culture. Social technology is beyond just IT installations or social media communication. Social intranet software and collaboration tools have the ability to dramatically enhance productivity, build employee bonds with companies, improve customer satisfaction, and unleash creative forces within employees and teams to build better products and services.